New leaked images may have just given us a glimpse of the rumored official charging dock for the Apple Watch. So far, if you've wanted a charging dock or stand for the Apple Watch, third-party options are your only choice, or, you could just stick to using the charging cable. But new leaked images from German blog grobgebloggt.de showcase an Apple-branded charging dock for the Apple wearable, indicating we may have an official option on the way very soon. 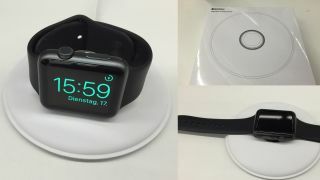 The images, some of which are shown above, reveal a round, CD-like dock with a middle part that can flip up, so that you can let your Apple Watch sit flat against the dock or sit up horizontally around the middle disc. A Lightning cable is attached to the side of the charging pad, with the whole set-up looking very minimalistic. As for a price, another image from a French website, as spotted by 9to5Mac, has the dock sporting a rather hefty price tag of 89 euros, which is about US$95. Of course, nothing has been announced by Apple, so the dock may not be an official Apple product - however, with the new Apple Watch OS 2 update bringing a new horizontal nightstand mode, we are inclined to think a dock is incoming.